We are now less than two weeks away from the official opening of CURVE and the Ribbon Cutting Ceremony scheduled for September 10, 2014, at 2:00. Please mark your calendars! While gearing up for our grand opening, CURVE personnel welcomed our home state’s congressional staffers from Washington, D.C., who were with us on August 28 learning about some of the exciting research and innovations happening at Georgia State. Visitors to CURVE included staff from the offices of Senators Saxby Chambliss and Johnny Isakson and Congressmen Sanford Bishop, Phil Gingery, Tom Graves, Jack Kingston, John Lewis, Tom Price, Austin Scott, and David Scott. After over a year of planning and months of construction, CURVE is finally a reality and is open to all students, faculty, and staff! The space went from media stacks to an amazing technology-rich research space. CURVE’s centerpiece technology, the interactWall, is a touch enabled, 24-foot-wide video wall designed for collaborative visual and data-rich research projects. Seven additional collaborative workstations, including an advanced 4K Workstation, feature high-powered PCs and Mac Pros that allow users to work with and manipulate large images and datasets. 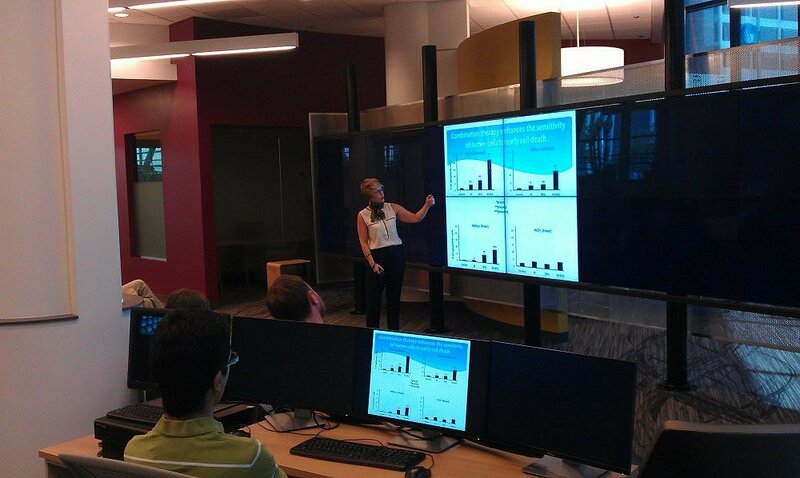 Each workstation is equipped with a large display that can accommodate up to six people, allowing multiple groups to work together on a research problem. Stop by and see what CURVE has to offer!